The River Esk and the Esk valley encapsulates the best of northern English countryside. Desolate moorland which at times can be bleak. A river gently flowing through forests, past hamlets and villages. A countryside that was once blighted by industry that is now a diverse and vibrant home to wildlife. In contrast to the sparsely populated hills, Whitby is one of Britain’s most popular traditional seaside towns, it is still a working port with a fishing industry. Throughout the course of the Esk there is a rich history and heritage. 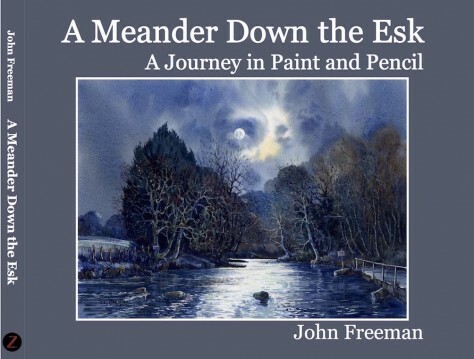 The supporting text to John Freeman’s watercolours and pencil drawings provides background information and explores the Esk valley of the past. A Meander Down the Esk will appeal to people who love the North York Moors National Park, the Esk valley and Whitby. Featuring 60 of John`s beautiful watercolour images and over 100 pencil drawings accompanied by over 18000 words of text in a high quality hardback book. Each copy is signed by John Freeman. A personal message can be added, please contact us to arrange this. 128 Pages. Approx size 12" x 9.5"
Original paintings and pencil drawings featured in the book are also available. Please contact us for details.